CAGJ authors were recently published in Third World Resurgence with an article about the ‘Super Banana’. 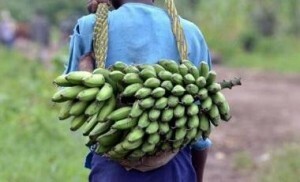 The drive by the Bill and Melinda Gates Foundation to introduce a genetically engineered ‘super banana’ into the Ugandan market can only be viewed as part of a powerful and coordinated effort to transform Africa’s agricultural systems to serve corporate and foreign interests. But that is not the policy at this internationally famous green grocery. I should say not. No no no no no no no. But we have no bananas today. RECENTLY student volunteers at Iowa State University in the US have become subjects in human feeding trials of what’s being touted as a ‘super banana’. As its name suggests, this is no ordinary banana; it has been genetically engineered to produce increased levels of vitamin A. Created for the Ugandan market, the ‘super banana’ was developed to mitigate nutritional deficiencies that cause blindness across the global South. Yet, in a nation where the banana is not just a staple food but also a cultural icon, Ugandans are furious about this latest international intervention into African agriculture. Bridget Mugambe is one Ugandan concerned about plans for bringing this banana to her homeland. ‘In my country,’ she explains, ‘there are over 50 varieties of local and indigenously cultivated bananas, and in my culture many of these varieties have individual cultural attachments. For example, in celebrations of marriage, birth and funeral rites, we use different varieties of banana for these different purposes…’ A social scientist working with the African Food Sovereignty Alliance, Mugambe argues that this new example of genetic engineering threatens not only Ugandan culture but also local economies and markets. And it is not even clear that the ‘super banana’ is necessary, since there are other low-cost existing means of addressing the problem of low vitamin A intake. Before the banana can be brought to Uganda, the country would need to change its laws to allow genetically engineered (GE) crops to be grown and consumed there. The Bill and Melinda Gates Foundation and the US Agency for International Development (USAID, currently headed by a former Gates staffer, Rajiv Shah) have been pressuring Uganda to do so. By changing its laws, the Ugandan government would not only contaminate the heritage varieties of banana that Ugandans treasure; such changes would also open the way for Monsanto and other multinational corporations eagerly waiting to push other GE crops to be approved for use. Of course, with $15 million in support from the Gates Foundation, the ‘super banana’ has some powerful backers. However, its opponents are organising. In October, Mugambe and eight other colleagues from the African continent travelled to Seattle, home of the Gates Foundation, to participate in the Africa-US Food Sovereignty Strategy Summit. In four days of conversations with US-based food activists, she and her colleagues discussed a much more worrying trend of which the ‘super banana’ is symbolic: new colonial attempts to dominate African agriculture. Over the last decade, Africans have witnessed an increasingly powerful and coordinated effort to transform their agricultural systems. While agricultural systems across the continent are diverse, agricultural production there remains dominated by smallholder producers and peasants. Together, they produce around 70% of food consumed in Africa. Because smallholders produce primarily for subsistence and secondarily for the market, they are not easily amenable to the profit schemes of multinational corporations. This is not the first time that outside groups have called for an agricultural revolution. In the 1970s, the Rockefeller Foundation partnered with USAID to introduce American agro-industrial production methods in South Asia and Latin America. By introducing hybrid seeds and chemical inputs, the resulting ‘Green Revolution’ was hailed as a success for increasing the yield of food crops. Today, however, we know that the Green Revolution did not in fact solve global hunger, which increased by 11% between 1970-90, nor did it improve the livelihoods of those who adopted these new methods. Third World farmers have simply been unable to compete with American crop exports that are low-cost because of US government subsidies. As a result, these farmers increasingly cannot afford to utilise the different technological systems (requiring the purchase of seeds, fertilisers and other inputs) that they were pressured to adopt in the 1970s. The violence of the Green Revolution is exemplified today by the thousands of economically ruined farmers who are committing suicide – tragically by ingesting those same chemical inputs that have degraded their land and driven them into debt. While Africa was also a target of the original Green Revolution, most interventions there failed. Africa’s strong network of smallholder agriculture is a testament to its farmers’ resistance to previous development schemes and colonial endeavours seeking to dispossess them of their land and livelihoods. In today’s age of ‘crisis capitalism’, however, a new scramble for African resources has begun. Colonialism in Africa has always aimed at extracting resources for the global North. Now, big agribusiness, Northern countries and global ‘philanthropists’, seeking to increase the sales of agricultural inputs and to replace small-scale farming with large-scale market-oriented agro-industrial production, have joined together in calling for a new ‘Green Revolution’ in Africa. Looking for opportunities to profit from Africa’s soil and mineral riches, they have mobilised images of impoverished farmers and utilised shrill narratives of crises – of hunger, climate change or population growth – to justify foreign land acquisitions, the introduction of biotechnology and the importation of new legal regimes aimed at ‘harmonising’ seed and agricultural laws. Responding to capitalism’s inexorable impulse for growth, these schemes aim to gain entry for foreign corporations into African markets. They are assisted by governments through agencies such as USAID and global partnerships like the New Alliance for Food Security and Nutrition (see box) championed by US President Barack Obama. These ‘public-private partnerships’ employ public resources to support private investment and profitability under the guise of development. Like the first Green Revolution, these partnerships often do not benefit smallholder farmers. Instead, they seek to integrate farmers into global value chains that draw them into debt and competition with large multinational firms. Moreover, these partnerships are not accountable to citizens of either the funding or recipient countries. Since 1997, the Gates Foundation has devoted over $3 billion to ‘improving’ African agriculture under the banner of alleviating global hunger. Over the past two decades, its Agricultural Development programme has grown to be one of the largest of Gates’ philanthropic endeavours. As this investment has grown, so has the criticism; the Foundation is becoming increasingly scrutinised by those affected by its largesse. As one of the world’s largest economic entities, the Gates Foundation not only shapes approaches to development, it sets the agenda. Its grants are aimed at direct, on-the-ground interventions, as well as scientific research, public relations lobbying and advocacy. Across its programmes, the Foundation has promoted technological ‘silver bullet’ solutions, rather than tackling underlying problems. Nowhere is this more apparent than in its approach to African agriculture. In 2006, together with the Rockefeller Foundation, Gates launched a subsidiary called the Alliance for a Green Revolution in Africa (AGRA). The ‘super banana’ in Uganda is just one example of the Gates approach. Though vitamin A deficiency is indeed a widespread problem according to the World Health Organisation, companies and philanthropists have used this deficiency to peddle new genetically engineered food products fortified with vitamin A. As in the case of the widely touted but so far ineffective ‘Golden Rice’, a product created for South Asian markets, the Gates Foundation has supported the production of the ‘super banana’ for the Ugandan market. The problems with this high-tech approach are plentiful. Firstly, it may not even be necessary, since programmes in the Philippines have been successful by distributing cheap vitamin A pills. Secondly, a recent report by The Ecologist cites how the ‘super banana’ is a clear case of biopiracy – stealing the genetic resources of developing countries without remuneration for use in products and programmes that benefit developed countries. The gene spliced into the ‘super banana’ was taken from the Fe’i banana variety indigenous to Papua New Guinea. Thirdly, like with Golden Rice, farmers have raised important questions about the health and safety effects of this new genetically engineered variety. Finally, Ugandans are concerned that it could contaminate and otherwise harm the many indigenous varieties central to local Ugandan markets and culture. Even the developer of the ‘super banana’, University of Queensland researcher James Dale, acknowledges that it’s been designed to open the door for the uptake of more GE crops in Africa and globally. In 2008, the Seattle-based trade and food justice organisation, Community Alliance for Global Justice, founded AGRA Watch. AGRA Watch challenges the Gates Foundation’s questionable agricultural programmes in Africa and argues that though the Gates Foundation and AGRA claim to be ‘pro-poor’ and ‘pro-environment’, their approach is closely aligned with transnational corporations such as Monsanto and foreign policy actors like USAID. AGRA Watch contends that the Gates Foundation/AGRA must be understood as a form of ‘philanthrocapitalism’ – the use of charitable funds to advance market-based approaches to social issues. The Foundation takes advantage of food and climate crises to promote high-tech, industrial agriculture that generates profits for corporations while degrading the environment and disempowering farmers. Recently, AGRA Watch analysed Gates Foundation grants for African agriculture (2009-11) in order to understand how well they measure against the Foundation’s claims of promoting solutions to hunger and fostering social justice. Although the Gates Foundation maintains that only a small percentage of its grants go to genetically engineered crops, AGRA Watch identified 42 Foundation grants related to genetically engineered organisms that amount to $300 million. In addition, 29 of the 160 grants investigated involved ‘market integration’ – linking of smallholders to global markets – representing $210 million or 40% of funding. These findings were recently corroborated in an independent study by the organisation GRAIN. As part of its ongoing work to hold the Foundation accountable, AGRA Watch hosted the set of strategic meetings in Seattle between 14 US-based organisations and eight Africa-based ones, representing a mix of national NGOs, international networks, small-scale producers and farmer networks, and community-based organisations. The Africa-US Food Sovereignty Strategy Summit marks the beginning of a new collaboration between African and US groups to contest the policies that aim to transform Africa’s vibrant smallholder farming systems into American agrobusiness. The African and US groups were united through an alternative vision of the global food system guided by the principle of ‘food sovereignty’ – a term originated by La Via Campesina, a worldwide network of peasant farmers – which asserts that the people who actually produce, distribute and consume food should control the mechanisms and policies of their food systems, rather than corporations and market institutions. All people should have the right to decide what they eat and to ensure that food in their community is healthy and accessible for everyone. Each morning, the Summit participants began their work by gathering in a mistica, a powerful practice originated by the Brazilian Landless Workers Movement (MST). Delegates contributed seeds, banners of struggle, and other meaningful objects to the centre of the room. Calling on ancestors, families, and joint moral and spiritual intention, this meditative activity cultivated a sense of trust and community among the US- and Africa-based organisations, strengthening their resolve to advance the struggle against philanthrocapitalism and the neocolonial scramble for Africa. Just one month after the Summit, Mugambe signed a letter calling for an end to the human feeding trials in Iowa and the ‘super banana’ project altogether. Now, however, she was not alone. Joined by over 120 organisations worldwide, African and US activists have committed to fight colonial agricultural interventions in Africa and the Gates Foundation’s call for a Green Revolution for Africa. Today, over one billion people remain hungry in the world, including an estimated 30 million here in the United States itself. Yet the US government, corporations and non-state actors such as the Gates Foundation promote solutions that are profitable to them but not necessarily beneficial to people in the Third World. Our solutions must not be driven by a narrow ideology; we already have enough food to feed the world – it must ultimately be distributed more equitably and ethically. The authors are members of the Seattle organisation the Community Alliance for Global Justice, and activists in its AGRA Watch programme (http://www.cagj.org/agra-watch). Matt Canfield is a PhD candidate in the Department of Anthropology at New York University. His research investigates global governance and the transnational food sovereignty movement. Phil Bereano participated in the negotiations on the Cartagena Biosafety Protocol and its Supplementary Protocol on Liability and Redress as well as work of the Codex Alimentarius. The G8 ‘New Alliance’ was founded in 2012 ‘to accelerate responsible investment in African agriculture.’ In addition to the G8 leading industrial countries and the EU, 100 corporations are involved as donors, and 10 African countries are now involved. It has been criticised, however, for being a mechanism used to compel African countries to create a more favourable investment climate for international agribusiness, instead of the needs of small producers. Posted in Agra Watch Blog Posts, Agra Watch News, News.